Home > Blog > What Type Of Anesthesia Is Used During Rhinoplasty? Local Anesthesia - Regardless of which type of anesthesia is selected, rhinoplasty is always performed with local anesthesia (lidocaine mixed with epinephrine) to directly numb the nose and reduce the amount of bleeding encountered during surgery. Except for very minor revisions few surgeons use local anesthesia alone due to the discomfort associated with the injection and the difficulty performing a complex operation on a fully awake patient. IV Sedation - relies upon the skillful dosing of powerful anesthetics through an intravenous catheter without the use of a breathing tube. For several reasons doctors typically prefer to avoid this type of anesthesia during rhinoplasty surgery. 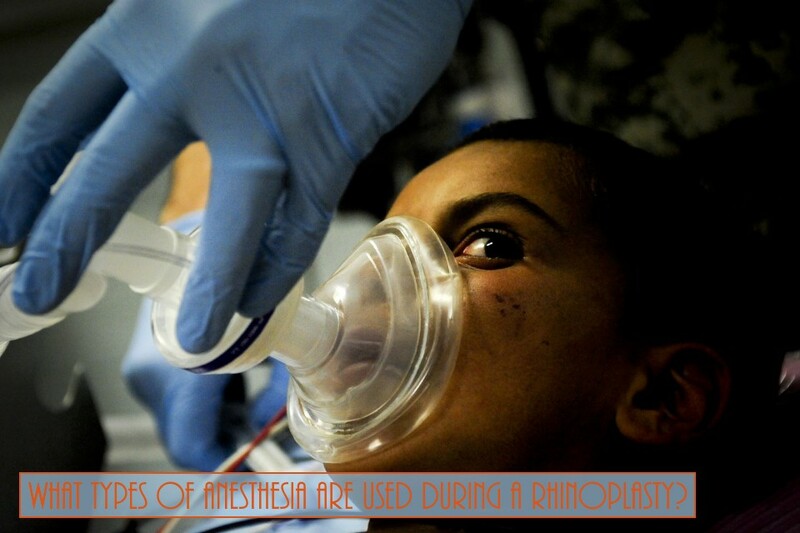 IV sedation must render the patient unconscious and motionless while at the same time avoiding breathing suppression. There is a fine balance between having a patient fully unconscious and breathing on their own versus not being fully unconscious and having sudden movement or having the patient stop breathing from too deep sedation. Also, bleeding occurs in all rhinoplasty procedures so there is always the concern that blood can drain back and be aspirated (inhaled) into the lungs during surgery if the airway is not protected with a breathing tube. Lastly, in more prolonged rhinoplasty surgery lasting several hours, it can become even more difficult to keep patients comfortable with IV sedation as patients can become restless and develop muscle soreness or a full bladder. General Anesthesia - The above concerns pointed out with IV sedation in rhinoplasty are better addressed with general anesthesia. In many ways general anesthesia creates the most controlled situation possible during your rhinoplasty surgery. With the addition of controlling the airway with a breathing tube your anesthesiologist is able to protect your windpipe from dripping blood during surgery. Also, you don't have to maintain your own respiration as the anesthesiologist is able to fully manage your breathing with a breathing machine. This allows for a deeper level of anesthesia which can be adjusted to keep the blood pressure low to help minimize bleeding, bruising, and swelling. Since the nose is rendered fairly numb from the local anesthesia injection, comparable levels of anesthetic are used as with IV sedation so the anesthesia after effects are usually quite mild and short lived. This more controlled, stable environment allows much better operating conditions and surgical outcomes.